A narrative is a brief summary of specific events experienced by patients, during the course of a clinical trial. Narrative writing involves multiple activities such as generation of patient profiles, review of data sources, and identification of events for which narratives are required. A sponsor outsources narrative writing activities to leverage the expertise of service providers which in turn requires effective management of resources, cost, time, quality, and overall project management. Narratives are included as an appendix to the clinical study report and are submitted to the regulatory authorities as a part of dossier. 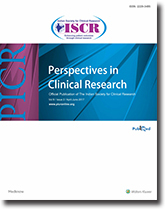 Narratives aid in the evaluation of the safety profile of the investigational drug under study. To deliver high-quality narratives within the specified timeframe to the sponsor can be achieved by standardizing processes, increasing efficiency, optimizing working capacity, implementing automation, and reducing cost. This paper focuses on effective ways to design narrative writing process and suggested best practices, which enable timely delivery of high-quality narratives to fulfill the regulatory requirement. Clinical trials and research studies are being conducted worldwide at a rampant pace leading to generation of large amount of data. However, to reap the benefits of the data generated it is important that this data is shared with the general public without which it can be deemed useless. Despite its importance being known to us, data sharing does not come without its share of problems and it is not as easy to execute as it sounds on-paper. Over the past few years, multiple coveted organizations around the world involved in research activities have come up with their respective guidelines and initiatives to make sure the sharing of research data is smooth and ethical. Developing countries like India have made a few strides in the right direction with some initiatives in-place, but there still seems a long way to go before unanimous data sharing can be a reality. The stakeholders may have to face certain possible repercussions due to data sharing but there is no doubt that if done in the right way, it can lead to universal development. Today, drug safety data collection in India is both manual and electronic with reporting of potential overlapping and duplicate data, which is likely incomplete for further review and analysis. Furthermore, standardized data collection and timelines are not aligned with international standards. Complete coverage of safety data from all sources throughout the life of the drug cannot be ensured. There is no requirement to submit periodic safety data in clinical trials to regulatory authority. There is clearly a lack of emphasis on deriving meaningful safety data insights for ensuring patient safety. Efforts toward the early detection of drug safety issues are minimal. There is no mandate to publicly disclose drug safety findings. Benefit-risk evaluation of investigational and marketed products cannot be assured merely through annual status reports and periodic safety update reports, respectively. Focused initiatives involving stakeholders from regulatory, health-care, and pharmaceutical industries are required to change the current situation and enable derivation of meaningful insights from safety data. Equal emphasis on assessing real-time safety of the drugs and protection of patients' rights, safety, and well-being is required. Periodic safety data reporting in clinical trials, proactive safety data collection related to potential safety concerns, electronic medical records, electronic expedited reporting, collection of targeted data from stakeholders, and standardized and harmonized data collection aligned to the International Council for Harmonization guidelines are required. The Central Drugs Standard Control Organization should implement requirements to submit Development Safety Update Reports, Periodic Benefit-Risk Evaluation Reports, and Risk Management Plans. 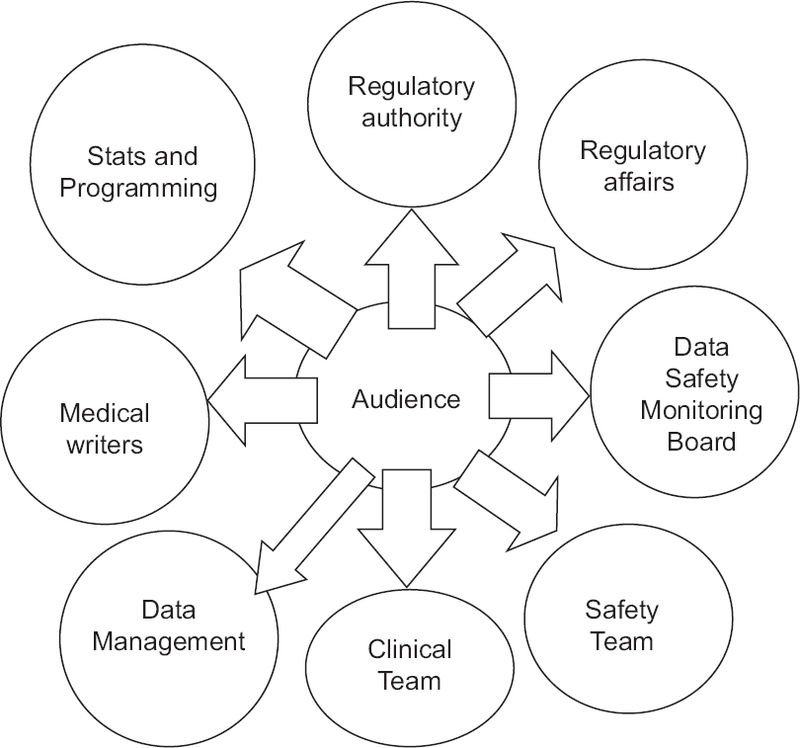 Access to clinical trials and postmarketing safety data through central repository would enable researchers to explore the data for application in clinical practice. In this “digital age,” the model of healthcare is changing rapidly, primarily in the area of communication that is happening among the major stakeholders each minute. Patients, being the central point of the importance of all the work and development, are more empowered than ever with information from various sources, among which social media is leading from the front. 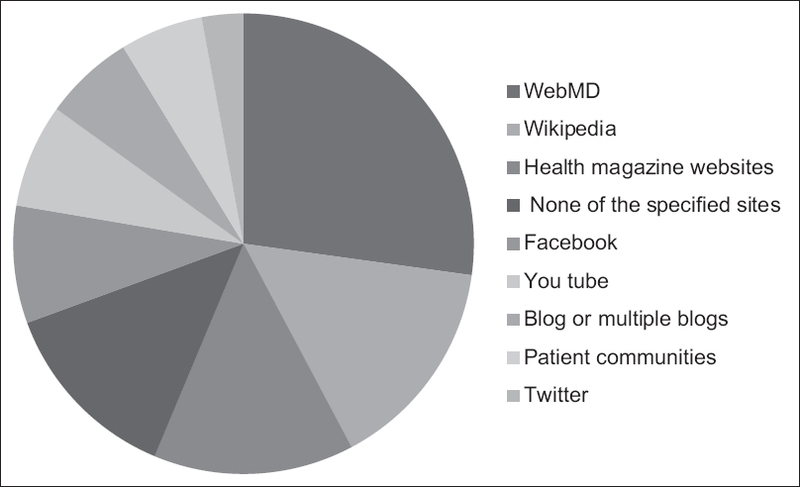 This article reviews how social media engages healthcare service providers, service seekers, and regulatory authorities. If the gaps in the current regulations are filled, better healthcare outputs can be triggered. This article also briefly explores the popular healthcare applications launched by leading pharmaceutical companies, encompassing the big data advantage, in this evolving era of patient centricity. Context: The determinants of over-the-counter (OTC) medication need to be understood to design adequate drug information policies. Aim: To determine the prevalence and predictors of OTC medication among the adult population of Berhampur town in Odisha, India. Settings and Design: It was a prospective, cross-sectional, observational study carried out in the private retail pharmacy on a convenience sample of 880 adults over a period of 6 months at Berhampur, Odisha, India. Materials and Methods: Medication use behavior was explored using a data collection form that had three parts. The first part captured data on the sociodemographic characteristics of drug consumers. The second and third part collected data on drug history and attitude toward the available health-care facility, respectively. Statistical Analysis: Descriptive statistics was used to represent the prevalence of OTC medication. Odds ratio and 95% confidence intervals (CIs) were used to determine the predictors of OTC medication. Results: The overall prevalence of OTC medication use was 18.72% (95% CI: 15.34–47.16%). Younger age, male gender, lower income, and poor lifestyle were the predictors of OTC medication. Perception of poor accessibility to health care, the presence of chronic diseases and having a symptom count of more than two significantly increased the likelihood of OTC medication (P < 0.05). Conclusions: Sociodemographic profile, drug history, and attitude toward health-care availability in the locality can predict OTC medication behavior. Interventions aimed at changing the perceptions of the public regarding accessibility, affordability of the health care is likely to influence OTC medication behavior and make it safer. Background: The composition of the Institutional Ethics Committee (IEC) with an equal respect plays a major role in evaluating research proposals to ensure the safety of the subjects and ethical quality of research project. It is mandatory that all research projects with an involvement of human subjects should be approved by the IEC before commencement. Aim: To find out the equality of respect to members of IEC irrespective of nature of their profession. Materials and Methods: Methods include a cross-sectional study, the general information and member composition, multidisciplinary nature, independent performance, competence, decision capability, professionally biased of IECs in health research institutions of Punjab, India. A structured self-administered questionnaire was developed and provided to all health/research institutions providing the graduate/postgraduate education in medical sciences under the jurisdiction of Baba Farid University of Health Sciences, Faridkot, Punjab, India. Results: Of the total 142 institutes, only 80 (56% response rate) institutes responded to the questionnaire. Of the 80 institutes which responded, 65 institutes (81.25%) had IEC, while 15 (18.75%) institutes lacked IEC. The compositions of only 22% IECs were in compliance to Drug Controller General of India (DCGI) guidelines and only nine (14%) institutes of the state of Punjab had approval from the DCGI. Conclusion: Study clearly indicates the carelessness of regulatory bodies and lack of fair practices toward constitution of the IEC. The ratio of nonscientific members (ethicist, philosopher, and layperson) in the IEC composition was incredibly low. This study also reveals the professionally biased and noncompliance with schedule Y guideline in relation to the representation of lawyers, ethicists, and nonscientific members. Background: Clinical trials play an important role in the generation of evidence-based data in health care practices. To ensure the credibility of data and the safety and well-being of the patients Good clinical practice (GCP) guidelines play an important role. At present, we have little knowledge about awareness of GCP guidelines among health care providers in India. Aim: To assess the level of awareness, and perception of the health care providers toward GCP and subsequent change in these after a dayer training session on GCP guidelines. 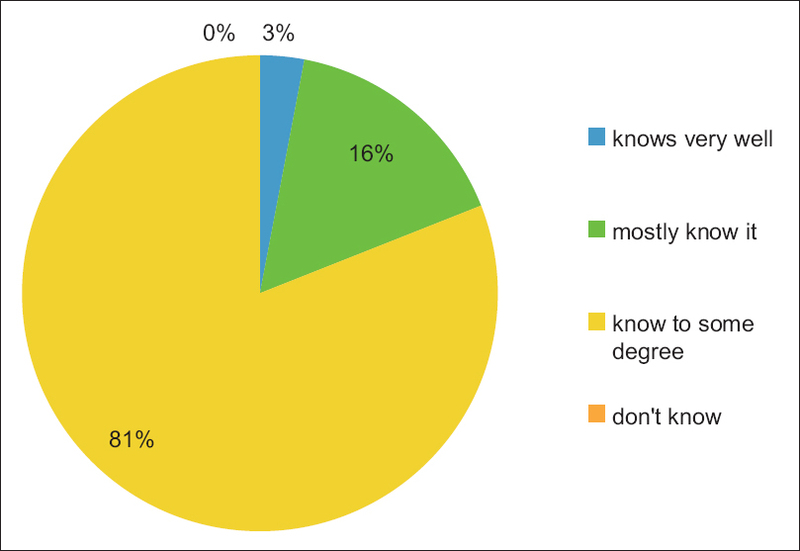 Settings and Design: A cross-sectional descriptive questionnaire-based study was conducted amongst health care providers, that is, doctors, dentists, nurses of a Tertiary Health Care and Teaching Institute. Materials and Methods: Participants were given descriptive questionnaire; they completed the questionnaire before and after undergoing a day training program in GCP guidelines. Statistical Analysis Used: The impact of the effectiveness of educational intervention among healthcare professionals was evaluated by two-tailed Z-test. Results: Out of 120 participants, 80 were medical doctors, 20 dental doctors, and 20 nurses. A dayse training program on GCP guidelines was found to increase positive attitudes toward various aspects of clinical trials. Conclusion: A day's training program on GCP guidelines may help to increase the knowledge as well as awareness about principles and techniques of clinical research, which will increase the credibility of clinical research in the country. Introduction: Evidence-based practice requires clinical trials to be performed. In India, if any clinical trial has to be performed, it has to be registered with clinical trial registry of India. Studies have shown that the report of clinical trials is poor in dentistry. Hence, the present study has been conducted to assess the type and trends of clinical trials being undertaken in dentistry in India over a span of 6 years. Methodology: All the clinical trials which were registered with the Central Trial Registry of India (CTRI) (www.ctri.nic.in) from January 1, 2007 to March 3, 2014 were evaluated using the keyword “dental.” Following information were collected for each of the clinical trials obtained from the search; number of centres (single center/multicentric), type of the institution undertaking the research (government/private/combined), study (observational/interventional), study design (randomized/single blinded/double-blinded), type of health condition, type of participants (healthy/patients), sponsors (academia/commercial), phase of clinical trial (Phase 1/2/3/4), publication details (published/not published), whether it was a postgraduate thesis or not and prospective or retrospective registration of clinical trials, methodological quality (method of randomization, allocation concealment). Descriptive statistics was used for analysis of various categories. Trend analysis was done to assess the changes over a period of time. Results: The search yielded a total of 84 trials of which majority of them were single centered. Considering the study design more than half of the registered clinical trials were double-blinded (47/84 [56%]). With regard to the place of conducting a trial, most of the trials were planned to be performed in private hospitals (56/84 [66.7%]). 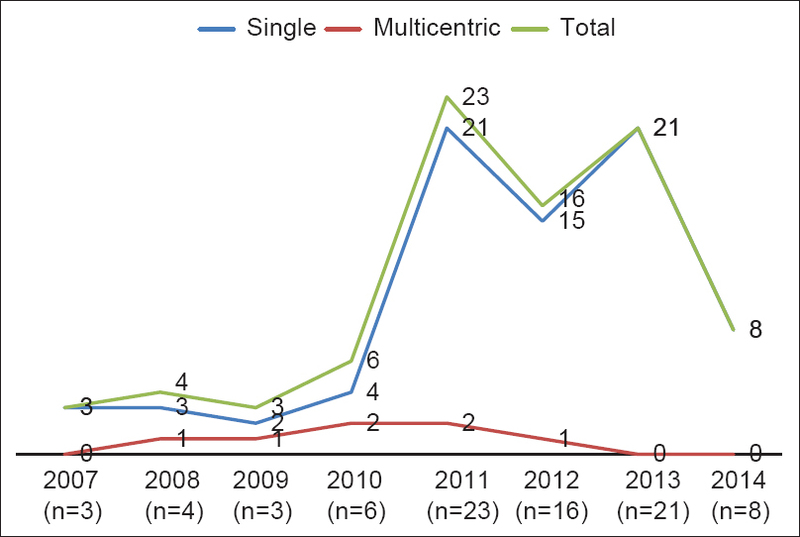 Most (79/84, 94.1%) of the clinical trials were interventional while only 5/84 (5.9%) were observational. Majority (65/84, 77.4%) of the registered clinical trials were recruiting patients while the rest were being done in healthy participants. From 2011, some of the postgraduate thesis trials had also been registered (2011-8; 2012-8; 2013-13; 2014-6). Inadequacy in reporting the method of randomization and allocation concealment was observed in 37/67 (55.2%) and 31/67 (46.2%) clinical trials respectively. A considerable number of postgraduate theses was also registered with CTRI in dentistry and majority of the clinical trials despite being completed are not yet published. Conclusion: The number of clinical trials in dentistry are low in India, and more focus should be placed by dental investigators regarding the reporting standards. Furthermore, researchers and trial sponsors should aim at publication of the research findings so that it is made publically available for use. A clear-cut need exists for an increase in both the quantity and quality of clinical trials in dentistry. In a previous article in this series, we explained correlation analysis which describes the strength of relationship between two continuous variables. 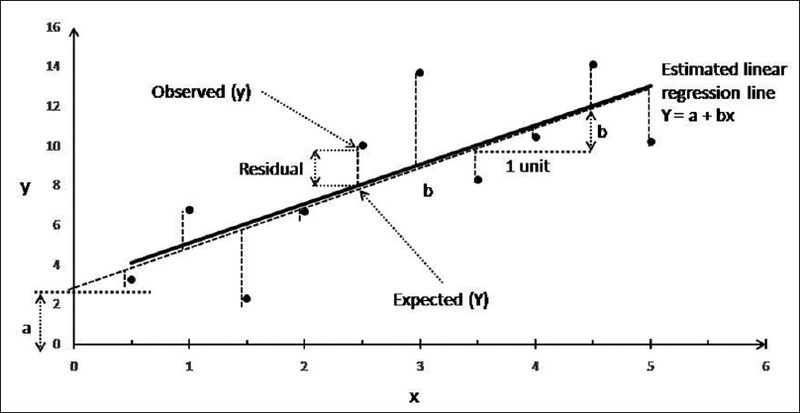 In this article, we deal with linear regression analysis which predicts the value of one continuous variable from another. We also discuss the assumptions and pitfalls associated with this analysis.